This is a difficult one to review. It was sent to us by Jaye & Joe of Pony Death Ride. These two are a duo who as far as I can tell specialise in comedy music. I wouldn't say it's predominantly ukulele, there are a lot of other instruments here and a mix of styles, Country and Western, Rock, Trance, everything. You've got to listen to the lyrics though, they'll appeal to anyone with cats in their life. The intro track "I'm A Cat Guy" has a bit of everything to start with, as a start it leads you in and tries to prepare you for the madness to follow. If you are, like us, one of those who wonders why Grumpy Cat has so much underserved fame, take solace in the ballad "Grumpy Cat (Ain't All That)" that puts that particular feline diva in his place. Firm & square (and fair). Not an album to play in the car with the kids, there are a few expletives scattered around, but overall it's a pretty good observation on life with cats and cat behaviour. 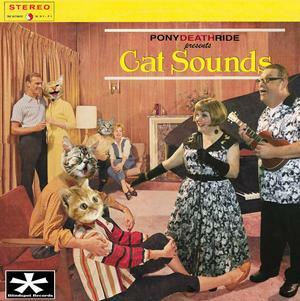 If you know anyone with cats, this album will make a great and novel present. If they have ukuleles too, then it's twice as good. We love the album cover. To be fair, it's not easy to describe the album in this review, it's so diverse and off the wall. Maybe this video by the artists will help to explain a little more! Buy the album here - it's something different, for sure! Thanks Jaye & Joe, you are completely mad. We like that. "Cats Chasing Cats" is a pretty accurate description of my life with Tillie.